Railway Maintenance & Repair Services Company | Remcan Projects LP. Your tracks take a beating. Every day, heavy trains full of cargo run over your tracks, and your conductors, engineers and surrounding communities rely on you to keep them safe. There is no margin of error here – a poorly maintained section of track can be catastrophic to your business and your people. 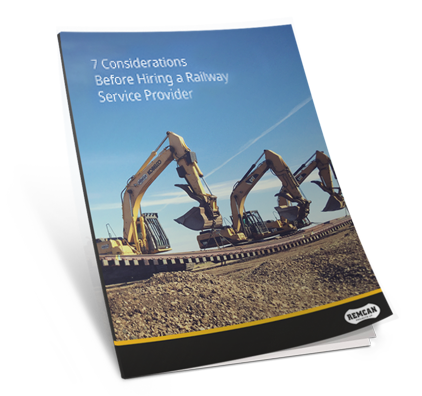 You need a railway maintenance provider you can rely on to ensure your tracks are kept in optimal condition, and that they are shut down for repair when maintenance is required. Our obsession with safety and quality allows us to provide complete track maintenance programs you can trust. Our goal is to ensure that every kilometer of track in Canada is working optimally and safely, and that means designing programs geared toward preventive maintenance, repair and emergency response whenever needed.